State Street Animal Hospital, PC provides a variety of professional dental services for your pet, using current dental techniques and instruments. We strongly believe in the importance of home care and carry several tools to help you take care of your pet’s oral health as well. According to the American Veterinary Dental Association, 85% of dogs and cats have some form of periodontal disease by the age of 3, so we strongly recommend a professional dental cleaning sooner than later. That way we are able to save your pets teeth instead of waiting until the disease has progressed to a point that they require multiple extractions. 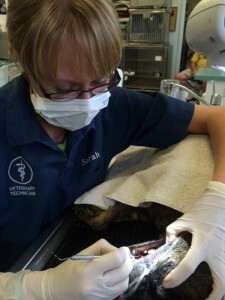 This approach saves teeth and is much easier on your pets as they are under anesthesia for a much shorter time. Along with being easier on your pets, it’s also easier on your pocketbooks! Extractions are very difficult and therefore expensive. So lets get those teeth cleaned sooner than later!